If you have children and they want to explore a new adventure in a healthy environment, let them learn a sport that that is fun and exciting, builds character, and keeps them physically fit. 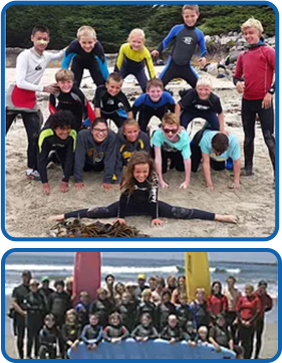 Our students develop a respect for the ocean, learn ocean safety, and environmental awareness, while playing in the waves and learning how to surf. This will help strengthen their appreciation of the ocean for the rest of their life. Open Ocean Surf Lessons & Camp's run during spring breaks, and through the whole summer. Bring your wetsuit, a bag lunch, warm clothes, a towel, and sunscreen as you join us on the water for surf camp. All ages are welcome. Let your child learn about the ocean and ocean safety, and build new friendships and great memories today. Princeton Jetty, also known as "Surfer's Beach," is a great place in Half Moon Bay, California, to learn to surf. The same ocean swells that break 40 or 50 feet at the famous Maverick's Point come rolling into Surfer's Beach in sets that make it perfect to teach your children how to surf.